Put some money in your pocket with the 2017 Show Me the Money with No Limits rebate program from CertainTeed. Have you looked into CertainTeed’s “Show Me The Money with No Limits?” It’s a loyalty program that rewards contractors who continue to choose CertainTeed Siding for their projects. Simply purchase any of the designated CertainTeed products throughout 2017 that qualify, and submit a rebate application by email, fax of mail. 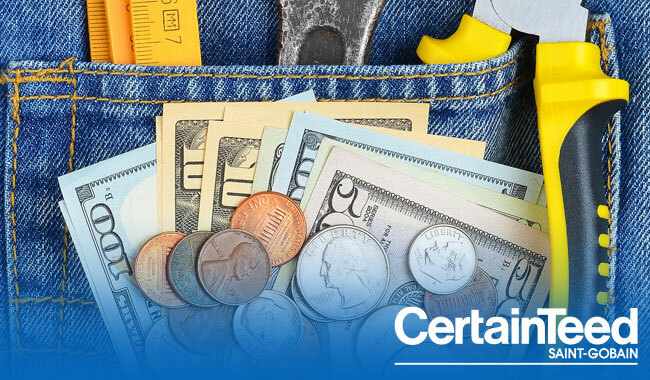 CertainTeed is the leading brand among professional contractors, and they want YOU to know how much they value your business. Use the button below to learn more about the Show Me The Money with No Limits program and apply to get your rebate today!